Small infestations can simply be blasted off with a jet of water. Or try spraying plants with a solution of soapy water, taking care to reach the undersides. To minimize potential problems attract pest predators such as ladybugs and hoverflies by planting flowers close by – marigolds are a good choice. You can even buy these predators to introduce into enclosed environments such as a greenhouse. 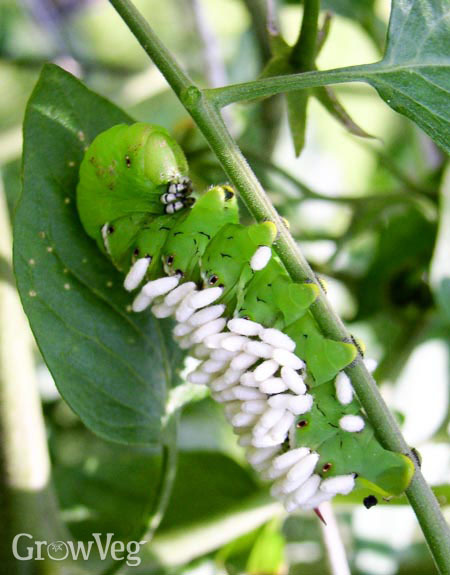 Many parts of North America are prone to tomato hornworm, a caterpillar that chews holes into tomatoes. Check plants regularly for signs of damage and remove and destroy any caterpillars you find. Cocoons like those shown in the photo above are great news – they belong to braconid wasps, which feed on hornworms to bring them under control. 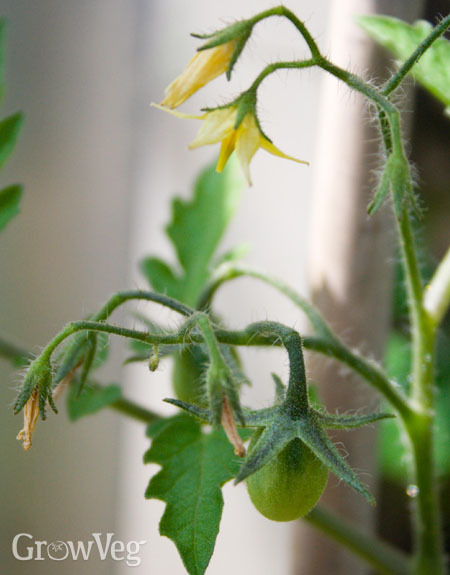 Ensure your tomatoes have enough water at all times, and feed them regularly with a liquid tomato fertilizer. This is the best way to guarantee your plants are getting all of the minerals and nutrients they need for healthy growth. Pay particular attention to plants in confined spaces, such as pots or growing bags. Provide as much ventilation as possible in hot weather. If your climate’s also very dry, raise the humidity around plants with regular watering. And make sure to feed your plants regularly with either an off-the-shelf tomato feed or a homemade high-potassium liquid fertilizer such as comfrey tea.